The six videos presented here document the two-year process of mapping Central Park. Each video focuses on specific aspects of the Park and the challenges in mapping them. The first video, “Two Years of Mapping Central Park” tells the background story of the Central Park map project. The folding map measures 36 x 26 inches unfolded. The southern half of the Park is printed on one side, and the northern half is printed on the other. A full-color Tree Legend appears on both sides. To order the folding version of CENTRAL PARK ENTIRE printed on durable, waterproof synthetic paper, simply click on the “Buy Map” button to the left. The poster map measures 59 x 17 inches and comes with a separate full-color Tree Legend for identifying the more than 170 tree species shown on the map. The poster and the Tree Legend are shipped in a sturdy cardboard mailing tube. 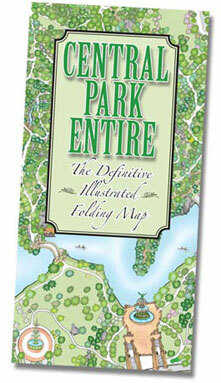 To order the poster version of CENTRAL PARK ENTIRE, simply click on the “Buy Map” button to the right.